Later this week, I’m looking forward to attending the 2018 Hamvention in Xenia, Ohio. Hamvention is always a highlight of my year. Last year, the Hamvention moved to their new location at the Greene County Fairgrounds in Xenia, Ohio. As the 2018 Hamvention quickly approaches, I’ve been asked by a number of readers and friends what I thought about the new location. No doubt, many are trying to decide if the pilgrimage will be worth it as they live several hours drive, or a flight away. Last year, I was asked to give a report of the 2017 Hamvention for The Spectrum Monitor magazine. I realized I never shared this report on the SWLing Post, so I thought I’d do so now, just a few days before Hamvention commences. In the past year, we’ve received several updates from DARA who host the Hamvention. I’ll include updates at the end of this piece. When the ground was dry, the flea market was accessible and offered some of the best diversity this treasure-seeker has seen in years. The long-anticipated 2017 Hamvention in Xenia, Ohio has now come and gone. As with each year of the Hamvention, what I enjoy more than anything else, along with learning about all of the latest innovations in our dynamic hobby, are the people: old friends and new, old friends and young. And of course, I also love browsing the flea market for vintage treasures! But this year, the relocation of the Hamvention drew many who wanted to see how a new venue might improve, impede, or simply change the event, and I was also among these. Many have asked about my experiences at the Greene County Fairgrounds–the new Hamvention venue–so I thought I’d offer an overview of the experience. But first, a little history. For decades, the Hamvention––the largest gathering of ham radio operators and enthusiasts in the world––has been held at Hara Arena in Dayton, OH, hosted by the Dayton Amateur Radio Association (DARA). But Hara’s owners folded their business last year , resulting in DARA’s immediate need to relocate the event. Since many national and international vendors risk big bucks to attend, and since comparable events in, for example, Germany and Japan take place in sleek, modern venues, expectations for a new venue were somewhat elevated. So last year when DARA announced the Hamvention would now be held at a county fairground in the small town of Xenia, OH, many were surprised, and a number expressed concern. DARA assured vendors and attendees that the Greene County Fairgrounds was up to the challenge. Regardless, the shift was certain to bring the unexpected. 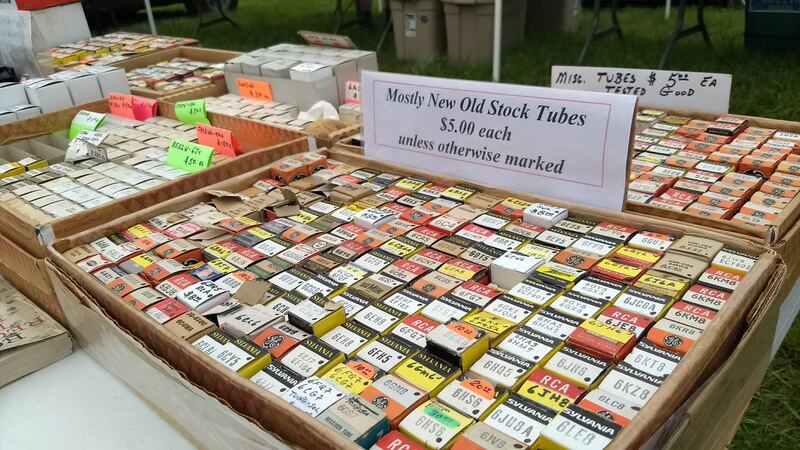 In truth any event that hosts 25,000 – 35,000 attendees will be a complex endeavor to organize, and that the Hamvention is also subject to this complexity became obvious as the weekend unfolded. Hamvention has always attracted a large international amateur radio crowd. Yet, the event continued: for, though Hara had many issues, the venue did manage to house the entire Hamvention crowd on one site, and––especially important to those with limited mobility––on one level. And fortunately the Hamvention is limited to only three days, so repeat attenders were likely to have mastered the requisite survival techniques for Hara. Even during rainy spells, the event attracted large crowds, and the outdoor flea market endured even mud since it was held on a large broken asphalt parking lot. (Yes…I am conveniently overlooking the year a pond of sewage bubbled up in the parking lot during the flea market…True story). But problems continued to, um, surface, and it seems inevitable that the owners finally decided to call it a day. No doubt, Hara’s days as a Hamvention venue were numbered, particularly because the dilapidated infrastructure continued aging without the the necessary reinvestment to keep it current––or even safe. Moving the Hamvention was now the only option. Xenia Fairgrounds: A “Five-Star” Facility–? Despite Hara’s shortcomings, many worried that a fairground didn’t seem like much of an upgrade. Still, DARA representatives gave assurance in numerous video interviews as well as at the W4DXCC conference that the Greene County Fairgrounds would make for a “five star” event. Now that the 2017 Hamvention has been and gone, was it a five star event? Honestly, I think the answer would depend on your perspective as either an attendee, an inside exhibitor, or a flea market vendor. To be fair, let’s look at some of the key areas that make or break large conventions like the Hamvention, and what conditions were like at this new venue. The fairgrounds are essentially located in the middle of a neighborhood. The roads leading in offer two lanes with two-way traffic, not designed to handle vast amounts of traffic. Hamvention organizers worked with specialists to sort out the flow of traffic into the Greene County Fairgrounds. No doubt, it was a complicated feat. If you attended Hamvention on Friday as an attendee, you were likely upset with how long it took to make that last mile to Hamvention. Several folks told me it took them almost one and a half hours to move the final 1.3 miles to enter the fairgrounds and park. Most folks who came that morning were naturally frustrated by this, and many were quite vocal about it. Friday evening, with the aid of Greene County Sheriff Gene Fischer and the local public service team, the traffic flow team sat down to hammer out a plan, and the traffic issue was almost magically resolved. I heard no complaints about traffic on Saturday or Sunday. Great job, folks! If it had been a dry, sunny weekend, I think the average attendee would have been pleased with Hamvention parking. Sadly, as it was not. Herein lies the greatest negative about the new location: mud. Lots of mud. While there were satellite parking lots with buses that ferried people to the event, many attendees, perhaps most, parked on the fairgrounds grass lots. The fairground fields are vast and hold lots of cars, but they are almost completely grass-covered. Many Hamvention visitors expressed concerns last year about the ability of the fairgrounds fields to handle the incredible amount of traffic of Hamvention, should it rain. We were reassured that the fairgrounds were well-drained and that the grass could handle the traffic. After all, they do hold fairs, and it had never been an issue. Unfortunately, the Hamvention weekend was punctuated with periods of heavy rain, fairly typical in spring. Both Friday and Saturday, it was largely sunny and the rain only lasted a quarter of an hour or so, but during the night storms passed through. The grounds were already somewhat saturated, so any additional rain resulted in––you guessed it––mud. Lots and lots of it. In short: if you parked at the Greene County Fairgrounds on Saturday, there was a good chance you might have gotten stuck in the mud. And the mud was truly thick, slippery, and nasty, designed to make locomotion difficult. At one point, I ventured into the parking lot and managed to tour it on a golf cart. I saw no less than two cars being towed out of deep mud. One, in fact, had sunk to the point it appeared to be floating on a sea of mud. During this time period, it was not only difficult to park your car upon arrival or to get your car out of the parking lot upon departure, but it was challenging to simply walk in the parking lot, or skirt around the deep muddy areas to enter the main gate. For those with disabilities, it must have been near impossible. In short: because of the rain, parking on site on those days was pretty undesirable. I’m not sure how DARA will sort this out next year, but I imagine it will involve numerous satellite parking lots if weather is bad. Gravel would be good, too. In contrast, as an inside exhibitor, I was very pleased with parking on all three days. We had a separate entrance with dedicated staff, and parking was close to the buildings where we had to set up each day. We had the advantage of parking on hard-packed gravel. It was a much better arrangement than the days of Hara Arena, even. All of the inside exhibitors I spoke with were pleased with parking. But I felt truly sorry for attendees parking in the field. Like the on-site general parking, the flea market was on the grassy fields of the fair grounds. Due to spongy wet ground and the number of heavy vehicles full of gear that had to enter and leave each day, even as early as Friday morning it was clear it was soon going to be a muddy mess. he mornings and after periods of rain made moving around the flea market quite challenging for some attendees and vendors. Friday morning was indeed muddy, but Friday afternoon, the sun came out and dried out much of the mud. It seemed a lucky break. That is…until a late afternoon thunder shower soaked the saturated ground again. The water table just couldn’t hold it all. So, Saturday and Sunday…? It was unfortunately muddy all day. Even the golf-carts manned by volunteers to help attendees ferry heavy purchases back to their cars could not enter many of the flea market paths for fear of getting mired down. Personal mobility scooters really had a difficult time, and many got stuck. I don’t think the bulk of the flea market was accessible to anyone in a wheelchair. In short, I imagine most flea market vendors were frustrated with the mud. This being said, I must say that the selection of goods at the flea market was even better than I’ve seen in previous years. If it had been a dry weekend, it would have made for very pleasant gear goggling and treasure hunting. Taken during setup the day before the Hamvention opened to the public. Note the healthy amount of space between vendor tables. Though I was a bit skeptical about the fitness of the large metal-framed agricultural buildings for inside exhibits, I was pleasantly surprised: these buildings are large, clean, well-lit, with an open, airy feel. Much better, in short, than most of the spaces at Hara Arena. All of the inside exhibitors I spoke with were, in general, pleased with these buildings. They were also pleased with the spacing between booths which allowed for improved traffic flow. There were a few complaints about outlets hanging from the ceiling, a feature likely used when the building is in service to show livestock. Inside exhibitors were overall very pleased with the steel buildings at the Greene County Fairgrounds. A few vendors felt it got a bit toasty indoors in the middle of the day when the sun made a cameo appearance. Still, I got the impression that most attendees felt the buildings were well-ventilated and relatively cool, and overall, an upgrade on Hara. The large, white event tents did house a large number of vendors. Because there were not enough permanent buildings on site to house all of the inside exhibits, DARA arranged for a large events tent––labeled “Building 6″–– to house all of the extra booths and tables. Many of us believed this could be a great alternative. However, I heard that very late in the game, DARA was informed that the large tent they had on order fell through. They had to find a last-minute alternative, which ended up being three smaller (though still large) event tents arranged in close proximity. The interior of the large vendor tents were rather dark. Note the light penetrating the tent seams. This shot was taken before vendors had set up. The booths in the tent were not marked or numbered in advance, so this lead to a lot of confusion for both vendors and (later) visitors. Adding to the confusion was the relative darkness of the interior of the two long tents. Later, during a series of thunderstorms that produced a lot of wind, it became obvious that the replacement tents also didn’t have adequate sand-bagging to hold down the side walls, which began flapping quite violently. The darkness of the interior of the two long tents was mitigated slightly by some decorative globe lights hanging from the center poles of the tent, but these provided very little in the way of lighting. When it was bright and sunny outside, it wasn’t too much of a problem, but when it clouded over, as when the thunderstorms passed through, it became very dusky and dim, indeed. During periods of rain, the tent vendors and attendees had to cope with water. The worst problem by far in these tents, however, was water penetration. The tent ceiling and seams were littered with holes. So, during downpours, water would shed off the sides of the tent then enter the perforations, raining down into the tents and forming minor rivers on the asphalt en route to the drains. Significant water in the presence of so many electrical drop cords became a rather risky shock hazard. During rain, tent vendors had to either move their displays…or just get wet. It’s telling that not a single tent vendor that I spoke with was pleased with their site. I spoke with a DARA representative about this, and he was very apologetic: clearly, DARA was not at all pleased with the last-minute tents. One of the volunteers I spoke with told me that as early as next year, there may be another permanent agricultural building or two to house all of the vendors that were in tents this year. This could be an excellent upgrade, and I do hope, should the Hamvention continue at this site, that it comes to pass. The Hamvention volunteer staff were incredibly helpful–and there were a lot of them, as well. I spoke with so many vendors who were also very pleased with the on-site security. These folks were friendly, helpful, and customer-focused. Thank you, volunteers! The outdoor food court was spacious and offered some excellent choices. No question: the concessions were better this year than any previous year I’ve been to the Hamvention. I heard compliments all weekend. Excellent job, food service staff! Hamvention forums were held in a dedicated, large air-conditioned building. The forum space was much better than that at Hara, and I expect most attendees were pleased. If you were an attendee on Friday, other than coping with traffic to the site, you were likely pleased with your experience at the Xenia 2017 Hamvention. By noon or so, the ground had dried up and most of the flea market was accessible; it wasn’t until late afternoon that it began raining. If you were an attendee during or following the rains, or on Saturday or Sunday, you may have enjoyed the event, but were likely quite frustrated with the mud. If you were a flea market vendor, no doubt, you were frustrated with the mud, which dramatically decreased foot traffic. If you were a tent vendor, you were likely frustrated with the poor lighting and water penetration–all of which affected customer traffic, especially during rain. If you were an inside exhibitor in one of the permanent agricultural buildings, you may have had the best sales, traffic, and overall Hamvention experience in decades. Most inside exhibitors I spoke with were very pleased with the facilities. I spoke to at least four major vendors that experienced record sales. While I’m not sure this year’s Hamvention can claim “five stairs,” I’d offer five stars for effort, and for improving upon Hara in a number of respects. Many thanks to all of the volunteers, staff, and attendees that helped create a terrific Hamvention despite its inevitable bumpy, muddy course following relocation. Obviously, lessons are to be learned from the 2017 Hamvention. Thoughtful consideration of this year’s problems are sure to benefit next year’s Hamvention if Xenia is to continue as its new home. I’ve written this review in hope that the stewards of the Hamvention will take this feedback in the positive spirit in which it’s intended, so as to improve upon the experience for next year’s Hamvention. Since traffic flow was sorted out Saturday and Sunday, to the great credit of those who reorganized it, there are really two main areas that truly need improvement: mud/water mitigation (yep, that’s a big one), and better accommodation for this year’s exhibitors that were in tents. Moreover, I think it’s essential that DARA provide prompt feedback and updates to those attendees and vendors who had frustrating experiences, reassuring them that their concerns were heard, will be addressed, and that circumstances will indeed improve next year. But ultimately, the Hamvention belongs to the entire ham radio community. We’re radio folks, which means we listen, we communicate, we design, engineer and build––just the qualities needed to help make the relocated Hamvention even better. So, let’s ask: what can we do to help? Let’s show up again next year with renewed vigor and a commitment to make the 2018 Hamvention a six-star event! As. of course, we can. DARA conducted a lottery to pick vendors who would get a space in the vacated furniture building. I also spoke with the Inside Exhibitors coordinator early this year–he said they hope to use a different tent vendor this year. I understand they’re also making more satellite parking areas available to keep the amount of visitors parked onsite to a minimum–this would also help with traffic congestion. An Inside Exhibitors team member also mentioned that they may take measures to regulate the amount of foot traffic going through the main gate to help mitigate mud; possible making a secure space to hold heavy purchased items. This forecast is four days out, however. With any luck, perhaps we won’t have the thunder showers we had last year. If the fairgrounds remain dry, many of DARA’s problems will be solved. I’ll be bringing my Wellingtons anyway. Of course, as I do every year, I’ll take hundreds of photos at Hamvention and post them here on the SWLing Post during the event. Stay tuned! This entry was posted in Ham Radio, News, Shortwave Radio and tagged 2017 Hamvention review, 2018 Hamvention, hamvention, Xenia on May 14, 2018 by Thomas.